Ideal for extending an existing IEC mains lead, just plug the IEC extension lead onto your existing IEC power cable to make it 1.8m longer. Ipod USB Travel Charger, USB Travel Adapter for UK, Europe, Australia and USA Ipod travel charger set, converts mains plug to USB. Supplied with adapters for UK, Europe, Australia and USA. Converts the mains power to 5V USB. Use your own USB cable to charge any USB device such as an Ipod, PDA, phone, MP3 player etc. 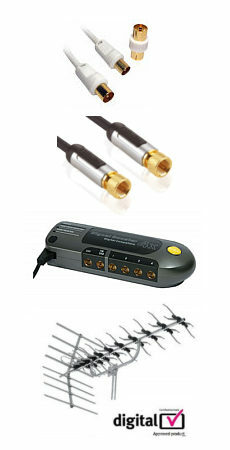 Input Voltage - 100-24 V ~ 60/50Hz 230mA. Output:- 5V dc 1000mA 5VA. 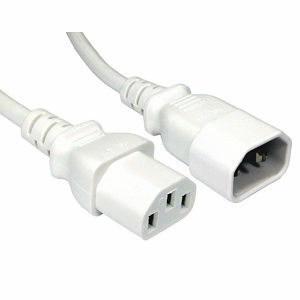 3m IEC Power Cable, UK 3 pin plug to IEC 3 pin plug (kettle style). Voltage rating 240V AC. Cable type, 3 Core. Colour black. Length 3m. 2m IEC Extension Cable, IEC Male to IEC Female (kettle style). Voltage rating 240V AC. Cable type, 3 Core. Colour black. Length 2m.